WhiteCloud Software Ltd. announced the announce the release of version 3.6 of EAComposer. An innovative and simple-to-use enterprise architecture tool used it to manage your IT landscape and technology portfolio. Delivered as a pure SaaS product: cloud hosted with a subscription based license model. 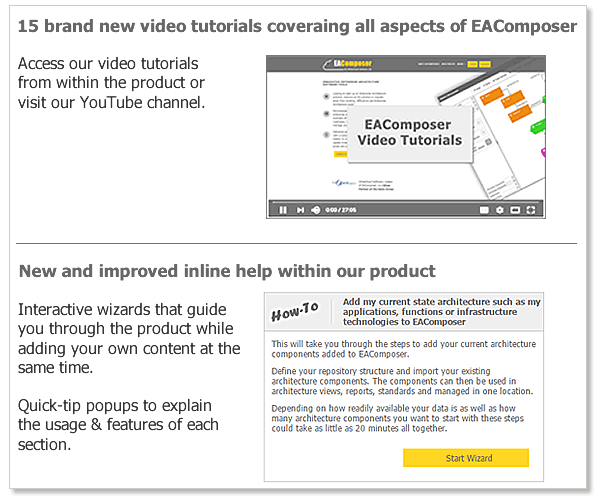 - We updated all of our existing video tutorials and added several new tutorials. There are now 15 video tutorials covering all aspects of the product. - Tutorials can be access from our Help Getting Started section or from each related section by clicking the video icon. - We added a new platform for providing inline help within the product. It allows us to create walk-through's, quick-tip popups and more. - With the new platform we created quick-tip popups which briefly explain the main features for each of the main feature areas. These popups will only be shown once and describe how that section is intended to be used and any relevant functionality to be aware of in that area. - We also leverage the new platform to enhance our Help Getting Started with self-guided walk-through's. These are bundled around major your EAComposer use-cases such as "Add my current state architecture such as my applications, functions or infrastructure technologies to EAComposer" or "Start using EAComposer with the TOGAF ADM to develop technology strategies and reference architectures.". We hope these enhancements will make it easier and quicker for you to start leveraging EAComposer. We welcome any feedback. If there are specific walk-through's you would like to see added please drop us an email via support@eacomposer.com.